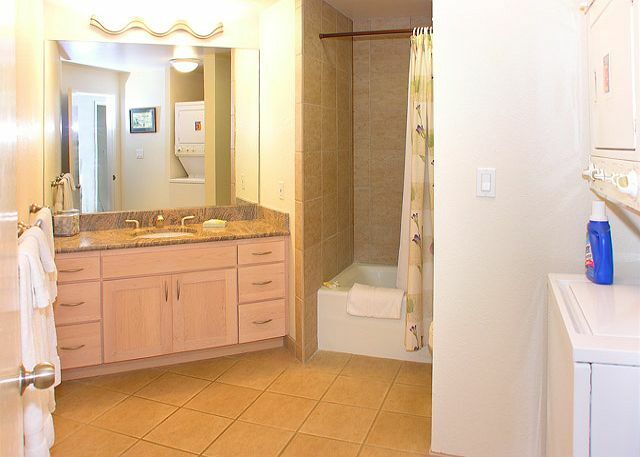 Spacious 2 bedroom, 2 bath condo. Washer/Dryer, fully equipped kitchen, stereo, Cable TV, VCR/DVD. 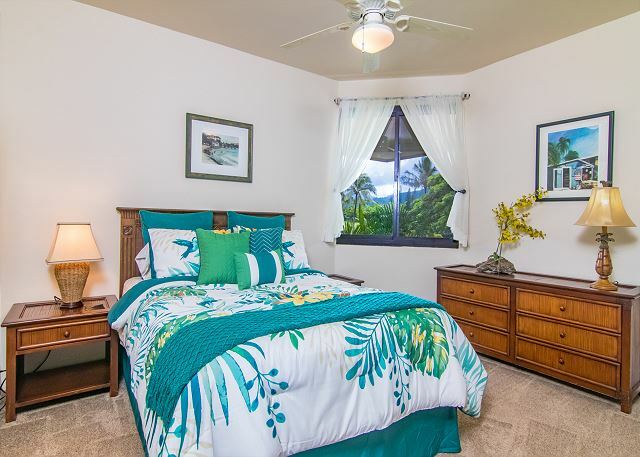 Ceiling fans and natural trade winds. 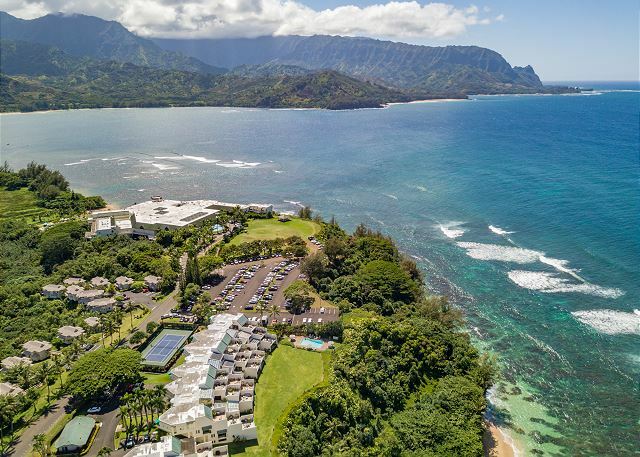 From the lanai and atrium of Pu`u Poa Units, the beautiful blue Pacific Ocean of Kauai's North Shore coastline is seen in both directions. 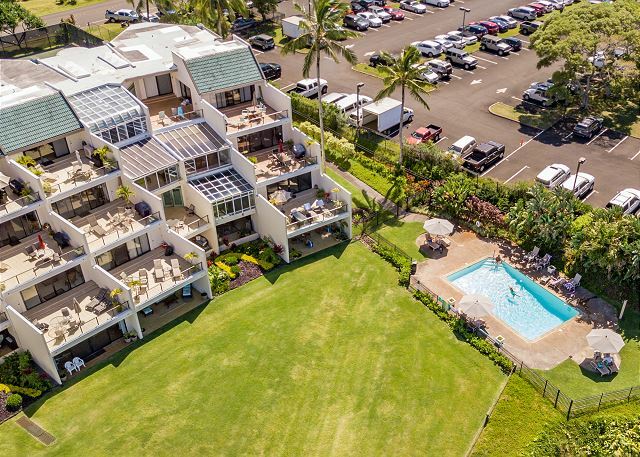 As a guest at Pu'u Poa #305 & RE/MAX Kauai, you'll have access to Kauai's Premier Concierge Service at (855) 665-2824 http://kauaiva.com/index.html, we will help you build your perfect vacation. Rooms Sleeps 5, Bed sizes: King, Queen, 1 twin futon. We loved Puu Poa #305. The unit was well equipped, clean, and well maintained. 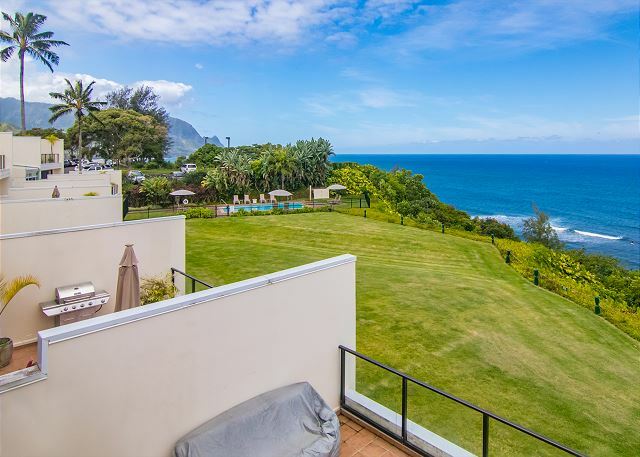 We enjoyed a wonderful 3 week in beautiful Puu Poa condo in Princeville, Kauai. 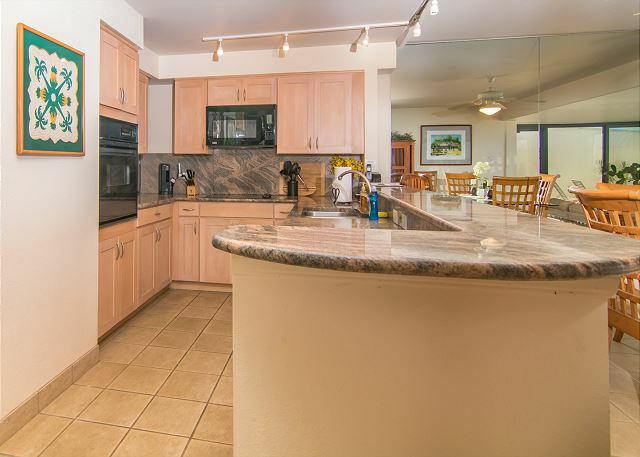 This condo is so well equipped with a breathtaking view off of the lanai!. So nice to have our own grill, which was used a lot! We decided on a "stay vacation" at Puu Poa #305 and our 10 days far exceeded our expectations for the rental was just perfect. It was conveniently located in on the property with only a few stairs up to the entrance door. The interior was immaculate and well appointed. Our kitchen had every appliance one could think of and the views of the ocean and Mt. Makana were so delightful - one views the ocean from the living/dining/bedroom and sitting out on the lanai was a special treat early in the morning. I cannot thank the management staff enough for all their assistance and professionalism. We had a great experience. We were in town for a family wedding and this was a - 5-minute walk to the st. regis. Great space and very well stocked condo, plenty of room to host family happy hours and great amenities for families. We didn't need it but saw a pack'n'play and highchair. The kitchen had top quality pans and knives. Would definitely recommend and stay here again. 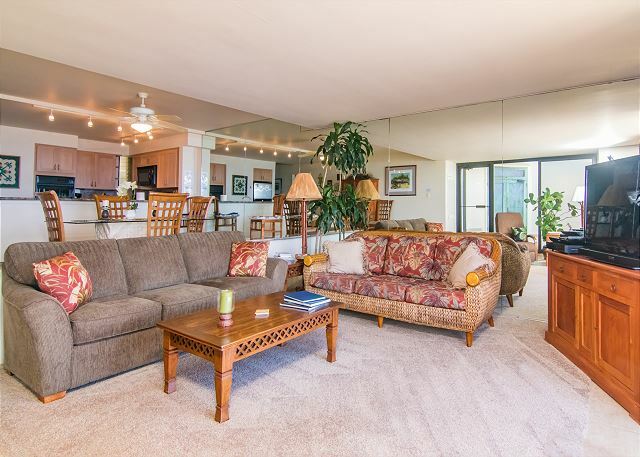 Comfortable condo with everything you need for your Hawaiian holiday! 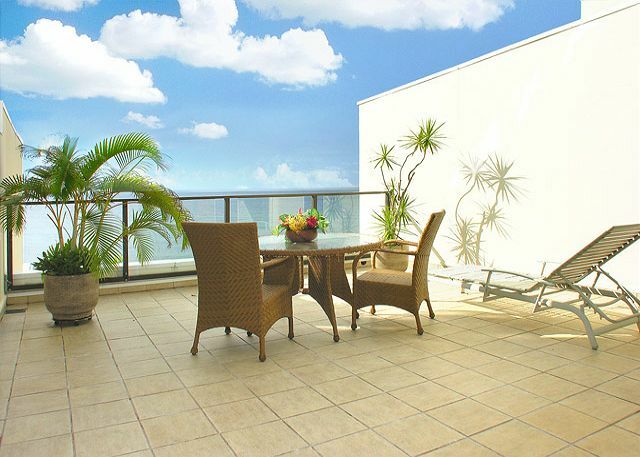 Walk into a well appointed condo and be overwhelmed with a breathtaking view any time of the day. 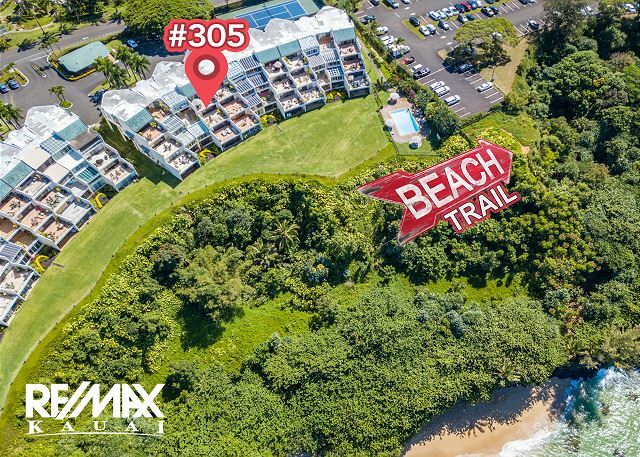 Very good location for taking trails to beaches below or a quick drive to Hanalei Bay and catch a boat to explore the Napali coast. Complex also has a convenient pool and tennis courts. St Regis is an easy walk for a sunset snack or a stroll on beach. Will definitely return and book another holiday. Condo was very comfortable, clean and was perfect. This is my second trip to Kauai. The first time we stayed at St. Regis next door. While it clearly is a reputable and amazing resort, I found our stay at the condo to be above and beyond. It's very spacious and even has 2 balconies. As far as location, you can't beat it. 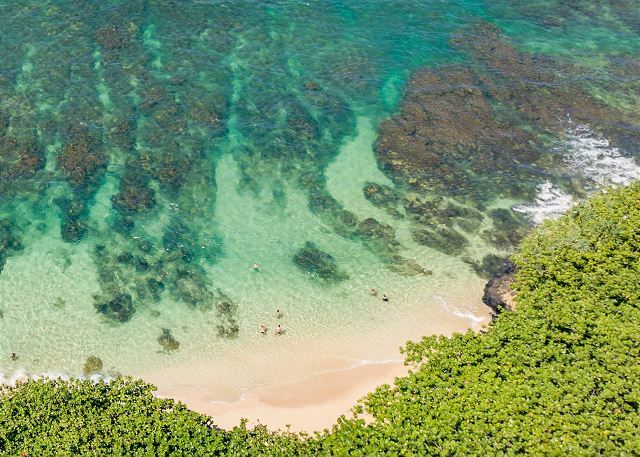 Close to some cool beaches and only 10 minutes from downtown Hanalei. The hosts provide a clean and well equipped place. I would definitely return! Talk about a week in paradise!!! What a Great condo! 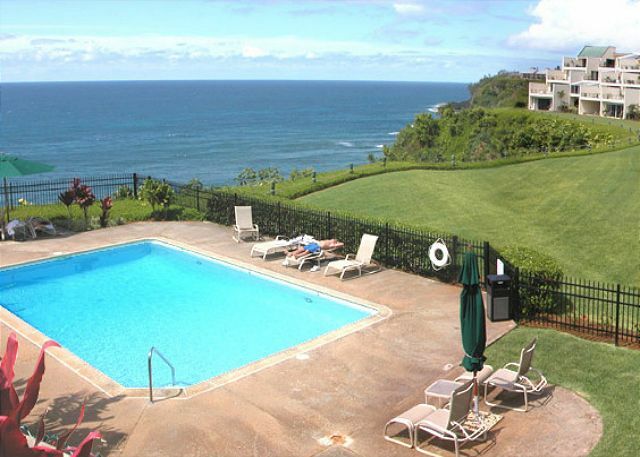 You felt like we had all the conveniences of home and then some on the beautiful island of Kauai. 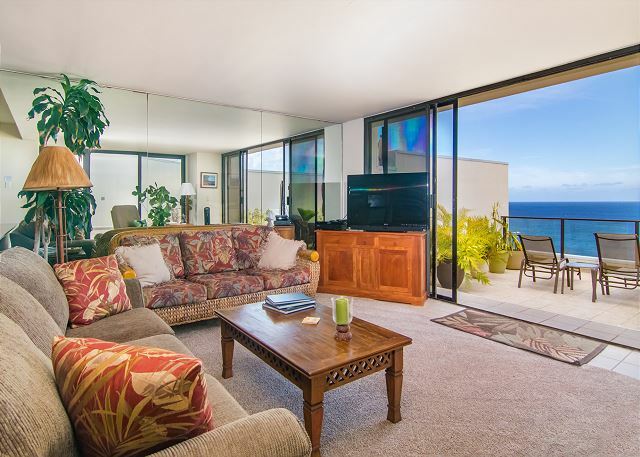 We loved the two lanai's, the beautiful view of the ocean and falling to sleep with the sounds of the waves. We had a few issues that were a slight inconvenience, but most were taken care of with one phone call to the management company. (1) The breaker for the living room outlets kept tripping, but it was quickly repaired. (2) There was an issue with the refrigerator. The ice machine leaked onto the floor in the kitchen, it had to be turned off to avoid the water works, but even after turning off the ice machine we had constant water on the shelves of the refrigerator and had to use caution in removing food as the water would pool on any food product. So keep your food covered to avoid added water. The problems were small, and didn't take away from the beauty of the area and the amazing condo. We will definitely be back!!! The condo was very nice and the perfect size for us. Our daughter, son in law, and their 8 month old son joined my husband and me for the week. The pack and play and high chair provided were a great help and we were very comfortable. 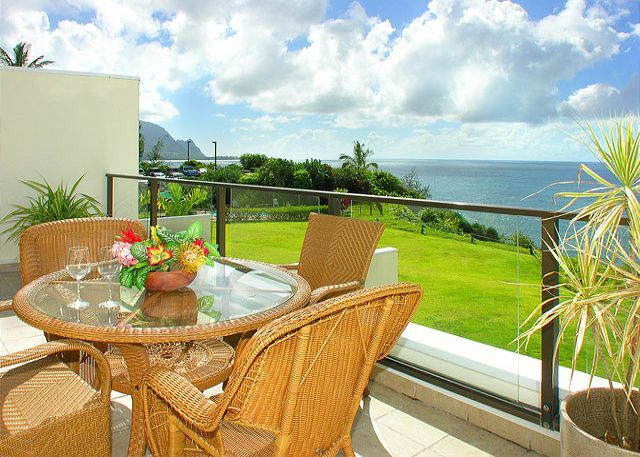 The view of the ocean is heavenly off the lanai! Check-in/out was easy and pleasant. View from living room is great. View from master is at an angle but sound of waves is wonderful. There was some pool construction we were not told about, but it wasn't too bad. A bit of deferred maintenance on the property, but the main turn-off were that the linens were old and the comforters lack duvet covers - gross. Beach is trail is a bit of a rope-climb and the beach is small and so-so. This was our second trip to Kauai. The condo was wonderful, We had several family dinners there, the kitchen had everything we needed. Also beach chairs and boogie boards,umbrellas, even coolers and kids sand toys,snorkels fins and masks. Would highly recommend this location, it was very quiet,I wouldn't take small children, as the beach access was quite a challenge. We would definitely go back here. My wife and I stayed in this condo for 4 nights during our visit to Kauai. 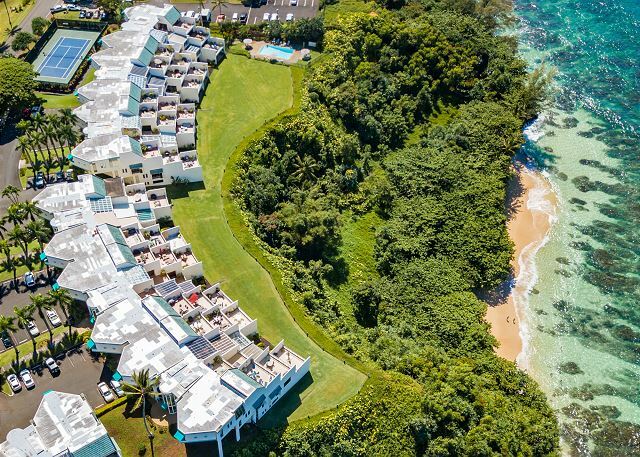 The condo is located in an ideal spot, with easy access to all north shore activities and adjacent resorts. Hideaways Beach is a short walk away and was very nice. The unit was clean upon arrival and had everything we needed. The view is spectacular and is clearly the highlight of the condo. Only complaints would be a few of the dishes were a little dirty and hadn't been cleaned all that well. Also, do know having no AC can get uncomfortable. We managed but between 12-5 it gets hot. We were usually out of the unit during these times so it was okay but I might try to find a unit with AC for our next visit. The appliances also didn't work very well - some of our food spoiled the first night because the fridge couldn't keep cool. The condo could use a little updating - it's got a little bit of a 90s vibe going on . Those are just nitpicky things and overall it was a very nice stay. We might book again here in the future. Great rental and greater location. Enjoyed snorkel gear and beach chairs. Hideaway beach had great snorkeling, although the path down could use some work. All in all was a wonderful stay. A great place to relax and enjoy the condo and view! The condo was perfect. Everything you will need and more. We had a great time and would return without question. Note: The watercolor art was amazing. I plan to purchase a print. A Delightful Stay in Paradise! definitely come back and stay at this condo again and again. I loved this condo. It had everything we needed in the kitchen and the closet had boogie boards and snorkels among other beach items. I gave it an overall 5 stars because it has been well maintained and the location is amazing. I gave it a 4 out of 5 stars for the condition/cleanliness because when we got there it looked like the cleaning person forgot to finish putting away the towels. There were unfolded towels left on the bed which looked clean so we put them away. Also some of the white hand towels looked dirty and should be changed out with new towels. There were crumbs on the sofa, too. Unfortunately the dishwasher was out of commission but we were given a small credit which was nice. The balcony had small ants which was OK with us and I'm not sure if this happens year round - this was the first time we traveled to Hawaii in the summer. We just ignored them but we never were barefoot on the deck. Overall, however, we would stay here again because everything else was spotless. The views were breath taking and the sounds of the waves would literally sometimes be too loud that we closed the sliding doors at night so we could sleep! The condo had no A/C but that was never a problem. The fans worked well although the dining room fan should be changed since it went too slow so the air didn't circulate as well in the dining area. The climb down to the beach was tricky so keep at least one hand free. The first time down, we carried way too much stuff. The location is great for hiking the Kalalau Trail which we did on a rainy day (not recommended). The trail was super slippery and our white socks are permanently red/brown from the red clay ground (maybe how some of the white towels got dirty). This condo was perfect for our family of 4 plus my mom who joined us. It was roomy and comfortable and the views were beautiful. Paradise at an affordable rate! We loved staying at Puu Poa 305. The location and view were amazing. It was great to have the lanai with the grill. The unit was decorated beautifully and the kitchen had everything we could have wanted. It was a steep hike down to Hideways Beach but well worth it, especially with the snorkel equipment included with the rental. Can’t wait to come back! Kauai at it's best. Perfect way to stay on the island. This condo is over the top in location and furnishings, decoration, linens, etc. Too bad we had less than perfect weather to interfere with the perfection. Two recommendations: Need instructions for the large TV. We couldn't get it to work properly. The condo needs a decent can opener desperately. 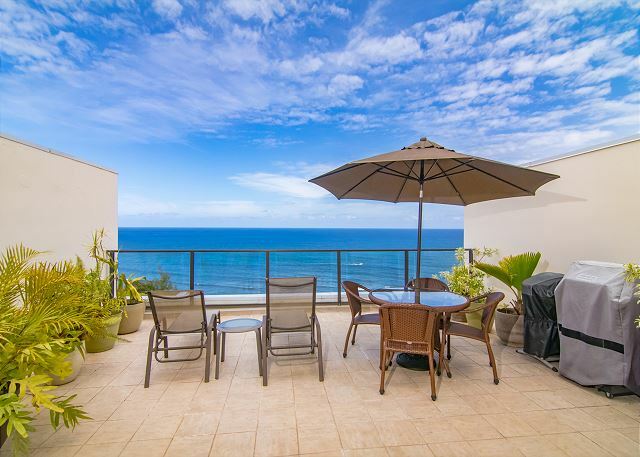 The condo is gorgeous, and I'd love to stay there again on my next trip to Kauai. I was able to spend it with a family slowly. It was a very wonderful room. was very well equipped. There are a number of great beach amenities including beach chairs, snorkel gear, and boogie boards. Do yourself a favour and spend a few nights here, you won't be disappointed. Gorgeous location and condo, views to die for. vacation rental, and look forward to staying here again on all subsequent visits. Thanks to the owners for sharing their slice of heaven with us! We were very happy with the property. The views are very nice, but the best part is that you can actually hear the ocean even with the windows closed. It's really relaxing to sleep with that sound in the background! We were a little bit bummed out that we didn't have internet the whole week and weren't able to get help from the property managers on that. I think it was a fluke problem, because there was a password on the internet that they didn't know about. But we did wish it had been fixed early in the week when we informed them about it. Breathtaking Still, the Second Time Around! Great views of Bali Hi and mountains plus the awsome shore below. Surfers are always out there in the mornings. Inside the place is really beautiful. The snorkle gear and chairs can in very handy. A few bugs here and there but it's Kuaui and tropical so they come with the territory. Tradewinds kept the place somewhat cool but at times it was warm. That could be due to the 'drought' that is supposedly apart of this Oct. Property managers were excellent. Even came out to help me in (it was my own fault, front door was smarter than I). Defenitely recommend this unit and REMAX for all their help. We spent almost 1 week here.